Garlock GYLON 3510 PTFE with a Barium Sulfate Filler. A high performance gasket sheet of PTFE with a barium sulfate filler that excels in high concentrations of caustics commonly found in the pulp and paper industries. 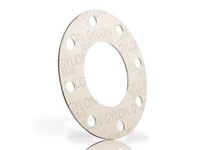 Garlock GYLON® gasketing is a family of flat PTFE gasketing materials. GYLON® high-performance PTFE gasketing is manufactured using a proprietary process that imparts unique physical properties, which are not obtainable through conventional manufacturing methods: Designed for severe chemical service, color-coded for easy identification, superior sealability, which helps reduce process and media loss as well as fugitive emissions, reduced creep and cold flow characteristics, and patented thermal bonding process to fabricate virtually any size gasket. The innovative GYLON® gasketing process reorients the PTFE and fillers in such a way to increase the material’s tensile properties and decrease the creep relaxation problems that usually plague PTFE products. In addition, the mixing process creates a homogenous material with consistent, superior physical properties that, unlike inexpensive skived PTFE sheet materials, do not fluctuate from one side of the sheet to another.